Greetings from Music City. Just got word I'll be playing a showcase at this years Americana Music Association conference in September. In other news, all during the months of July and August, SIP CAFE in East Nashville has displayed ten pieces of the limited edition American Fork Hand Painted LP Jacket series. As was done with my last few albums released on vinyl, I created a special edition of hand painted or hand screened LP covers whereupon I recycle old vinyl jackets and paint new covers on them. It often starts with one or two basic designs and then morphs from there. 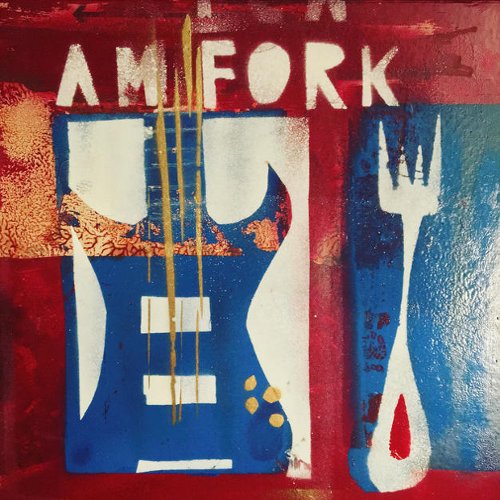 For AMERICAN FORK, which officially comes out on LAST CHANCE RECORDS and iTunes on SEPTEMBER 2nd (2016), I used two basic themes of an electric guitar, a fork, and a font that I designed which spells out my name and the album title. The entire process is just another way for me to express myself outside of music. I am the father of a five year old, so art and crafts are common around the house. I couldn't throw paint around and expect my kiddo not to participate. Sometimes, in order to dole out an art chore, I would ask her to cut and glue pieces of road map to the vinyl jackets as they were in various stages of development. When all is said and done, I will have completed 100 pieces, some of which will be displayed around galleries and records stores around the planet, others that will be shown only on line at TimEaston.com or on my social media feeds. If you are interested in owning one of these unique pieces, please reach out to me Easton@TimEaston.com. The average price for one painted LP jacket (with 8 original songs on vinyl inside) is $60. Prices may vary depending on whether or not a gallery takes a percentage, if the piece is framed or not, or if shipping and handling needs to be considered. Every piece is different. There are similarities, but no two covers are exactly the same. Here's to making more music and art and not paying attention to the ridiculous snares of the gatekeeper. Here's to freedom in expression. Here's to finding the occasional needle of satisfaction in the haystack of creativity. See you around the neighborhood. VIDEO PREMIERE OF "BROKEN HEARTED MAN"